I’ve traveled to over 50 countries in six continents, and to this day, Bali is still one of my favorite places in the world. When I first arrived in Bali last year, I felt broken. Six months prior, I had left my corporate life in New York City behind, and was in the midst of a social experiment in which I circumnavigated the globe by couch-surfing – never using the website, only human connection. I was running out of money, I hadn’t seen friends or family since I left home, I was sleeping in the homes of stranger after stranger, and on top of that, I was also freelancing and trying to figure out what to do with my life once my project wrapped up. I was completely burned out from the physical, mental, and emotional exhaustion. Then, I came to Bali, and it healed me. Specifically, the Balinese people did. I spent my days here with locals who shared their wisdom and philosophies with me, and along the way taught me lessons that I will hold with me for life: to open my heart to meaningful human connections, live life in the moment, and prioritize taking care of myself. I usually stay away from places that are notoriously touristy, but Bali manages to strike a comfortable balance between the tourist, expat, and local populations. The island’s huge expat community makes it particularly ideal for longer stays; you could visit for weeks, or even months, and not feel like you’re on the other side of the world. Whenever I missed home, I had my fair share of Western restaurants, meetups, and coworking spaces to pick from. The variety of options available on the island makes it an ideal hub for digital nomads and entrepreneurs, and I was constantly meeting interesting and international people from all kinds of backgrounds. In fact, I believe that half of the magic on this island resides in the hearts of the locals inhabiting it. Wise beyond their years, welcoming, and impressively pious, the Balinese have a gentle nature that envelops all those who come into contact with it. I love their humble dedication to everything they do: how they take the time to make a small offering to their gods every day, to protect their work-life balance, and to relentlessly devote themselves to their family. 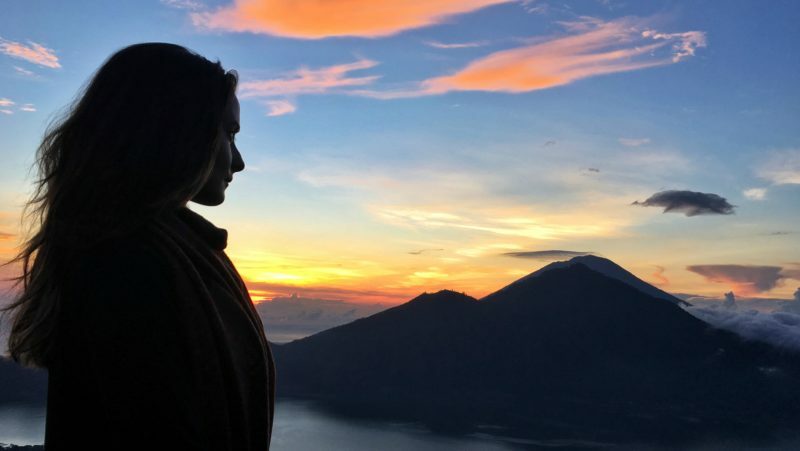 My time in Bali was spent navigating between the expat and Balinese worlds, depending on my mood and needs. I loved that I had the option to experience a piece of home, while also being able to mingle with and learn from the Balinese. It’s hard to run out of things to do while in Bali. There is always an adventure to be found, and the island’s diversity makes it suitable for just about anyone. There is raw beauty all over and around Bali. The island boasts a myriad of impressive volcanoes, crystalline beaches, world-class diving, diverse nightlife, iconic ricefields, and and gorgeous waterfalls. Breathtaking hiking can be found all over the island, as well as on the nearby Lombok and Java islands. If you’re looking for a quick beach getaway, the stunning Gili or Nusa islands are just a couple hours away. Adventure in Bali is not only an activity, it is also a mindset. Every day, I would wake up and do something unanticipated and exciting, and that could range from hiking a volcano at sunrise and exploring waterfalls in the afternoon to spending the day going to yoga, the beach, and one of the island’s many trendy coffee shops. In Bali, you don’t need to know what the day will bring, but there are plenty of opportunities to make it exciting. At any given point, there was sand between my toes, dust on my skin, and dampness on my clothes from either sweat, rain, or ocean water. Somehow, I didn’t mind it – I cherished the feeling of always being on adventure mode. Bali is often described as a place for healing, and once you visit it, you’ll understand why. 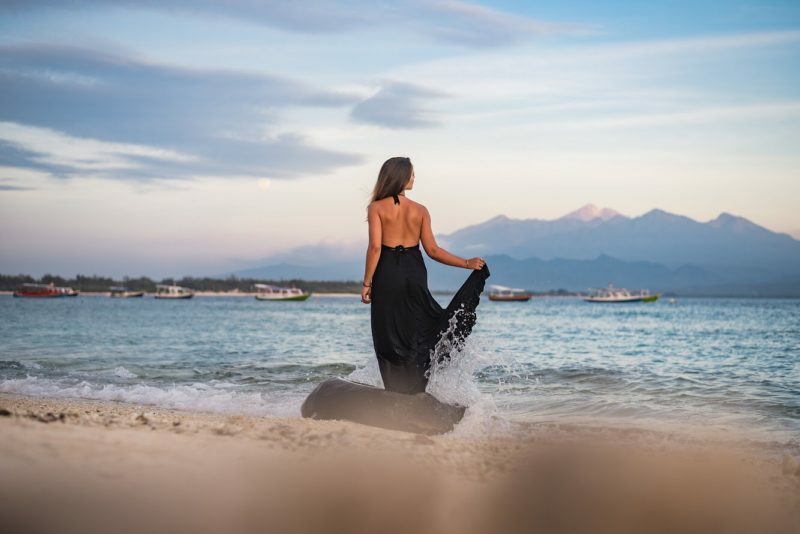 The island is laden with opportunities for self-care: there are massage parlours, healthy restaurants, yoga studios, and natural healing centers everywhere. The best part is, these services are so affordable (on average, a one-hour full-body massage costs around $6 USD) that it’s quite easy to treat yourself to at least one act of self-kindness every day! The easy, affordable access to self-care makes it an ideal place to restore balance in your life. No matter what lifestyle we have chosen, creating balance is a challenge that we all face. Most of us keep ourselves pretty busy, and a lot of times it’s by doing stuff that we are convinced is important, but isn’t actually when you look at the big picture. For me, Bali is the perfect place to reset that equilibrium, and to carve out time to work and play. Her words neatly summed up my appreciation for Bali and the philosophies I’ve picked up during my visits here: no matter what you do, do it with love, enjoyment, and joie de vivre. To me, this translates to surrounding myself with interesting people, days full of adventure, and acts of self-love. The ease at which I can achieve this equilibrium here has made Bali one of my favorite places on the planet.